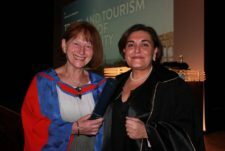 Congratulations to our Associate Marina Novelli on her recent inaugural lecture at the University of Brighton on ‘Travel and Tourism in the Age of Sustainability’. Marina was recently appointed Professor of Tourism and International Development and her lecture highlighted the many practical projects on which she has worked and advised in her career so far. One such example was Basecamp Maasai Mara in Kenya, which – against all cultural barriers – was the first to have a woman as the manager of a luxury camp. Visitors are able to grasp what women’s empowerment is really about. Their journey goes beyond the ‘Big Five’, facilitated by female guides teaching them about climate change, strategies to address environmental problems including drought that they face on a daily basis, as well as solutions such as alternative energy and water reuse. These women, who have not gone to school, have had the opportunity to attend local educational projects funded through philanthropic engagement by tourists. 118 women who would otherwise stay at home are involved in creating crafts that tourists buy, particularly beads. Visitors have the opportunity to learn about the crafts and how they are made by interacting with the very women who made the bracelets or keyrings they buy in the souvenir shop. Internet ordering helps sales continue when they go home– 80% of sales are now made online. This reduces the risks associated with a volatile tourism industry. Their products have entered into the global supply chain, being sold at Macy’s in New York and the National Geographic shop in London. Marina also highlighted her work (together with Equality in Tourism and some 30 other civil society organisations) on the Berlin Declaration on Transforming Tourism. You can read more about our work on this important challenge to industry and government here. You can watch Marina’s lecture in full here.